Mary’s is looking for the best picture of any sight from the world! It is necessary to take a photo by yourself. Anyone who has an account on Facebook. I have a picture, what shall I do next? - Become our Fan on Facebook https://www.facebook.com/marys.cz. - Open a tab on our Facebook page "Photo Contest"
- Click on the "Gallery/Upload" tab at the top of this page, then click on the "Upload" button in blue and select the photo. How many pictures may I send into the contest? There can be only one picture attached to one user, however there is no restriction on how many family members or friends can participate. From when to when the contest takes place? From 27th May 2013 to 1st August 2013.
Who can rate the pictures? Get the most likes to your picture, because the picture which will have them the most will win. Share among your friends. How many winners will be? What will the winner get? Actually, there will be just one winner. 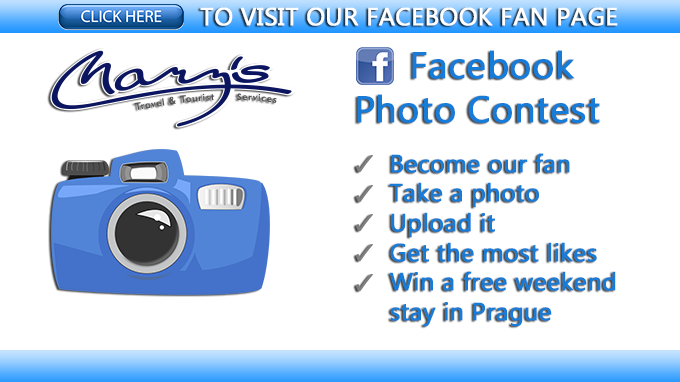 He or she will win a free weekend stay for two in our Prague apartments this autumn. Mary´s Staff will contact the winner after the contest. That’s a question we cannot answer :). Don’t wait, travel, take picture and upload it!